A happy Columbus Day to you all. While Americans may have varying reasons for embracing this annual holiday, the flamboyant parade now cascading down Fifth Avenue has long been a constant. Long reigned as one of New York City’s finest traditions. Mr Alan Greenspan, the former Chairman of the Federal Reserve, described in 2008 that the world economy was in a "once-in-a-century crisis". I guess he was surprised, and so did everybody else basically, that the global economy has hardly recovered at all after all these years. In 1980, developing Asia accounted for 7 per cent of the world GDP at current market exchange rate. By 2015, it had captured more than 20 per cent. Of the top 500 global companies ranked by Fortune in 2015, 190 were Asian-based; that was up by some 60 per cent from just a decade ago. Leading the way is the Mainland of China. Since the beginning of its opening up in the late 1970s, the Mainland's economy has ascended in a phenomenal way to become the world's second-largest economy, the largest trading economy as well as the largest manufacturer of goods. China's GDP actually expanded nearly 30 times in real terms from 1978 to 2015. Apart from the Mainland, the economies of the ASEAN countries and India have also expanded, on average, better than 6 per cent per year, far outstripping the performance of major advanced economies in the West. In its latest report, the IMF has lowered its forecast of global growth in 2016 to 3.1 per cent, with 60 per cent of the growth coming from Asia. And that trend will continue, with growth in Asia expected to average 6.3 per cent a year in the next five years, markedly higher than the 3.7 per cent predicted for the world over the same period. While the prominence of Asia and China in the global economy is being recognised, some observers out there, including a few international credit rating agencies, have been suggesting that the slowdown of China's economy in recent years will create strong spillover effect and add further downward pressure to the global economy that is already weak. And its growth target for this year – at 6.5 to 7 per cent – would surely ignite calls for a year-end parade in most countries. With the Finance Minister likely basking in a float of his own, and hoping for just half of that growth rate. You can see the progress of Mainland’s reform in its changing demand composition. Increasing purchasing power, along with the expanding income of a growing middle class, is transforming China from an investment, export-led economy towards a consumption-driven economy. In the first half of this year, consumption expenditure accounted for more than 70 per cent of the Mainland’s economic growth. That’s an important aspect that we need to recognise. China nowadays is more than just the world's factory. It is also a worldwide leader in e-commerce as well as an international hub for advanced telecommunication technologies and manufacturing. The surge of start-ups in the IT and software sectors, coupled with the rising investment in research and development, will provide further fuel for this new growth engine. Hong Kong has been a dynamic and critical player in China’s economic evolution since the late 1970s. We have long been our country’s vital intermediary, channeling foreign investment and capital to fuel Mainland's extraordinary growth. We are, by far, the world’s leading offshore Renminbi business hub, with a mature range of services from trade settlement and foreign exchange trading and hedging, to financing and investment. We count the largest offshore Renminbi liquidity pool at some 750 billion yuan at the end of July. And, in the first half of this year, some 70 per cent of the world’s Renminbi payment transactions were processed in Hong Kong. That’s sure to soar in the coming years thanks, in part, to the IMF’s decision to add the Renminbi to its SDR basket starting from the beginning of this month. I would say that's a milestone in the Chinese economy’s integration into the global financial system, as well as a providential opportunity for Hong Kong. One you can be sure that we shall run with. This is evident in the fact that Hong Kong is the world’s second-largest recipient of foreign direct investment in 2015, next only to the US, according to a UN report. It is evident also from the fact that nearly 8 000 overseas and Mainland companies keep their offices here in Hong Kong. And more of them are coming here every year. We are also readying ourselves to take our place in the grand and visionary Belt and Road Initiative that may well be the most ambitious multilateral undertaking of the 21st century. The two corridors of the Belt and Road Initiative encompass two thirds of our planet's population and account for a third of global GDP and a third of the world's merchandise trade. Ladies and gentlemen, Hong Kong has all it takes to play a central role in delivering as well as in realising the massive potential of Asia and China. I am confident that Hong Kong will play an even more important role in the days to come in the long-term ascendancy of Asia and China. 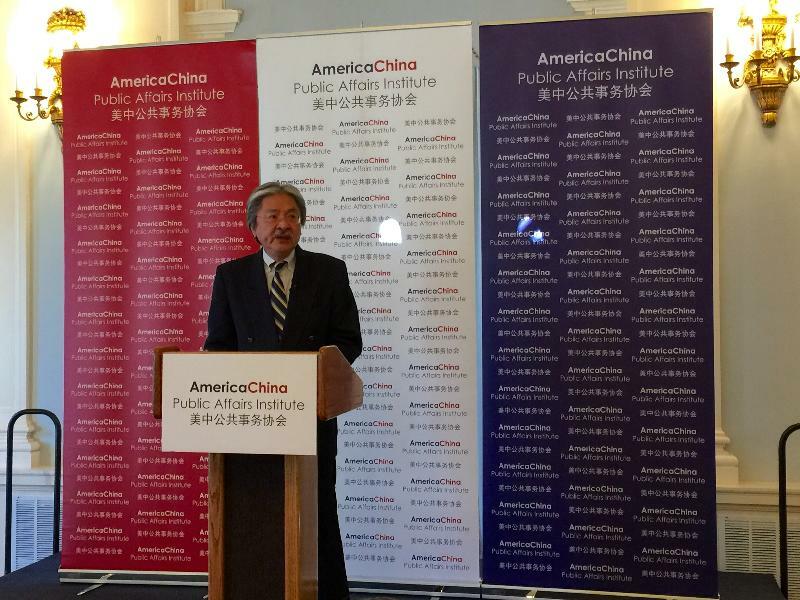 I would like to thank the America China Public Affairs Institute for giving me this delightful opportunity to meet with you all today.